Since we've had a dog for over 2 months now, it's been my goal to make sure that my house does not smell like a dog when you walk in. 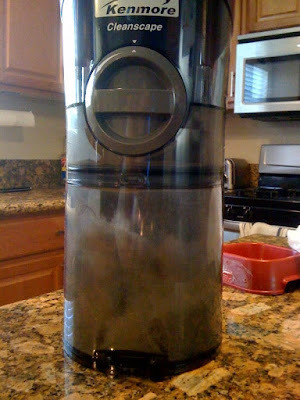 Our old vacuum was about a $20 lightweight piece o' caca. Steven had it since he was living with Mr. Rodriguez in their apartment before either were married. I never liked it, but being on a budget, we just didn't get a new vacuum when we got married. Today however, we finally purchase our new vacuum. After nights of research and some help from some friends, I decided on the Kenmore CleanScape. I'm in love with vacuuming now! It's super quiet and not too heavy. I even vacuumed our mattress and it picked up so much dust! Keep in mind, the picture above is my first run with the vacuum in the living room after I had just vacuumed with our old one the day before. Nasty! i totally need a new vacuum as well. how does it do on hard floors? Awesome on my tile floor ! On sale at Sears for $179....do it!